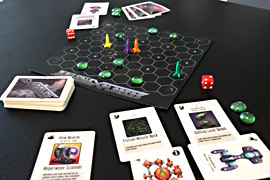 Infinite Space Explorers is a game of exploration and discoveries. The game is designed to set up and play easily and quickly, yet provide the essence of a star spanning galactic adventure. Fleets are moved from system to system on a star map, and new items and allies are found along the way. Conflict between competitive aliens is likely, and combat between starship fleets is almost certain. All such interaction is handled by brisk card play.